Miranda Kirschel, Chair of the UK branch of Women in Nuclear (WiN) has been awarded an MBE the New Year’s Honours List for services to equal opportunities in the nuclear industry. The award is recognition of the rapid progress that WiN has made in promoting the industry to women and women in the industry less than two years since the UK branch was formed. 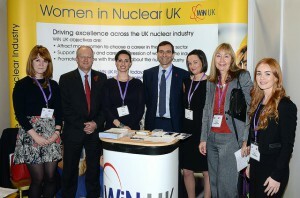 Miranda (pictured here third from the left on the WiN stand at this year’s NDA Decommissioning Event) who works in Energy Advisory for EY (formerly Ernst and Young) first entered the nuclear industry in 2001 at the Nuclear Industry Association and following her time as Head of Corporate Affairs there moved on to work with CH2MHill and Atkins before joining EY last year. She has been joint President of WiN UK since its formation in early 2014 since when it has grown to over 1,000 members.